How familiar is the feeling of cramped shoulders and strained eyes? Although the MacBook Pro is a beautiful laptop, especially the latest models with a beautiful Touch Bar, using it can be a pain if you have to consistently view the screen from odd angles or contort yourself to find a useable position. This is why elevating your MacBook with a laptop stand is becoming more and more common. Besides elevating laptops for those with an extended display, a MacBook stand will allow you to adjust your posture to make working on your Mac more relaxing and comfortable. It can also help prevent machine overheating issues, and many models will give you extra space and help you clear clutter from your desk. In this guide, we'll cover the best MacBook Pro stands in several styles, and help you decide which is right for you. Simple for just a little lift, the Steklo X-﻿Stand is a great option and it gives you a slight tilt for better posture. Sturdy and stable for just one location (such as next to an external monitor), mStand b﻿﻿y Rain Design is very stable with six inches of lift. Solid but portable, Vogek Foldable & Portable Stand is the best choice for the job, as well as sleekly designed. To clear desk space while you’re not using your laptop, the Vogek U-Cradle Vertical Laptop Stand will hold everything in place and look good doing it. It may sound fitting to actually place your beautiful Mac on a pedestal while you use it, but how do you know you actually need a stand for your MacBook Pro? A laptop stand is useful for almost all regular Mac users because it helps you address or improve the issues mentioned above. However, you probably don't need it if you use your Mac mostly in uncommon locations such as on public transit where there is no flat surface to set it on. Otherwise, even infrequent utilization of stands will still be worth your money. Buying a Laptop Stand: What to Consider? When you think of a stand for a computer, you may picture something which the computer rests on top of (aka, horizontal). But stands for storage (usually vertical ones) are also offered in the market, and typically hold your computer upright to save desk space while you aren't using it. So, consider your individual needs before deciding which type of stand to purchase. You should also make sure the stand you choose support your using habits. If you know you tend to put more pressure on the keyboard when typing than other users, or use your MacBook on an uneven surface, you'll need to look for a more sturdy and versatile model than someone who types lightly at their desk. 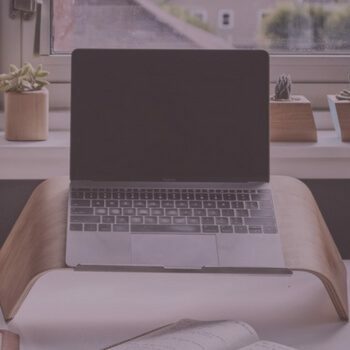 If you primarily use your laptop at a single location such as home office, you may not be concerned about the portability of the item you choose. But for those who travel a lot, have multiple offices, or otherwise use their MacBook Pros in a wide range of locations, the weight of a product becomes an important point to consider. Though there aren't many technical specs involved in choosing a stand, it's best that you also make sure your favorite one supports your MacBook size (e.g. 13-inch, 15-inch, etc.). While many are adjustable, some are not and may have weight limits or distinctly shaped frames meant for specific screen dimensions. Please note that the products listed below are our picked based on our personal preferences. We do not intend to rank them in this order. The vertical stand we recommend is listed in the fourth position. This long-trusted stand is sturdy and very stable. mStand lifts your Mac laptop almost six inches and tilts to have it as close as possible even at a greater height. It's one of best options for those of you who also use an external monitor for your Mac. Pros: Good lift, extremely solid and sturdy design. Space underneath can be used for storage of external keyboards, mice, or books. Cons: Not portable, only limited to be used primarily at one location e.g. at an office. If you need just a little bit of slant to your MacBook Pro to help with posture and positioning, the X-Stand will be the best option to consider. It can help raise your notebook without dramatically altering the way you use it. It's small and discreet, and you won’t lose any desk space. Pros: Adjustable for different laptop styles, good for airflow, portable. Cons: Very little lift, and less sturdy than models with a solid, rectangular design. If you need something both sturdy and portable, this one from Vogek is definitely worth considering. It's stable with the awesome silicone feet design. It's convenient to carry as you can easily put it into a backpack after folding the legs. Also, the sleek silver perfectly matches a typical MacBook Pro, and will go well with colored models as well. Pros: It has foldable legs (easy to carry) and a sturdy design that will limit rocking or leaning. Besides, you can adjust angles. Con: A bit heavy as it weighs about one pound. Another great product from Vogek, though this one is a little different as it's vertical (unlike the other three we recommended above). It's a great option for those who are looking for a laptop storage since you'll be connecting your MacBook with an external monitor and keyboard. This vertical stand has an appealing minimalist design, and it can store your MacBook Pro safely and protect it from potential coffee spills. Plus, it has a very small footprint especially compared to the space it saves. Pro: The sturdy design doesn't risk tipping, save desk space, and it comes with several colors to match your personal preferences. Con: Still fairly close to desk level, posing risk for the laptop than a taller stand. We recommend getting a stand to elevate your MacBook. You'll have a cleaner desk and a safe place to keep your laptop even when you aren't using it. It's the sort of investment that will continue to benefit you even several years later. Besides the size of your MacBook model, type and shape, and portability of the stand, there aren't really many other technical specifications you should consider before selecting the best one to your shopping cart. If you've made an order and while you're waiting for the product to arrive, here are a few tips for reducing strain, and PCWorld also has a number of tech habits to avoid making in general, all to help you get the most out of your MacBook Pro. Anyway, buying a stand isn't a complicated process, we hope the information in this guide has helped you make the right decision.